What if you knew when you were going to die? For a while it didn’t matter but now… Now the time’s drawing near and there’s so much more still to live for. And what if your mother’s even more full of enthusiastic life as you approach your expiration date? 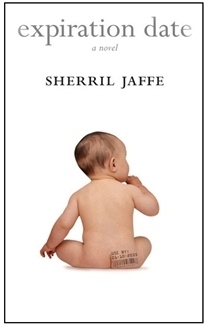 Sherril Jaffe’s novel Expiration Date tells of that all-important year in the lives of Flora (almost 60) and her mother Muriel (84). Muriel’s life is delightfully ordered and organized. There’s bridge, with all its attendant rules. There’s dinner, preferably not alone, since that would remind her too much of the absence of Jack after his long illness. And there are trips to San Francisco to spend time with Flora. Just at the time when her life should be winding down, Muriel starts to step out; and however many times the Angel of Death approaches her, she seems to escape unscathed. Meanwhile Flora’s expecting the angel’s visit before her next birthday; but according to her vision, Mother dies first, so maybe Muriel’s staying alive just to cheat the prediction and save her daughter’s life. Flora’s husband Jonah is a rabbi. His flock includes several elderly people and relatives. They’re familiar with death in its many guises, and Jonah is familiar with the literature, continuing a conversation with rabbis through centuries who’ve left their stories written down to continue the tale. Yes, a time is decreed for each. And no, that doesn’t mean we can’t change the outcome. Bridge sticks to the rules. Faith bends them. And love fits in between. Approaching ends make the present day more poignant, more needing to be filled. And these characters fill their present quite delightfully, while musing on the past and keeping a constant eye out for the future. Expiration Date tells their story beautifully—a masterpiece perhaps of tell-don’t-show, emotions revealed in thought and story carried forward by contemplation. The game of bridge defines a rigid code where truth lies in well-defined conventions somewhere between speaker and word. Family ties have a code of their own, born of tradition and memory. And love’s simple rule, to touch and be touched, by the world and the people in it, fills Sherril Jaffe’s novel with beauty, humor and hope well-told, then delightfully, wonderfully shown once the code becomes known. Disclosure: I was given a bound galley of this book by the publishers, The Permanent Press, in exchange for an honest review.